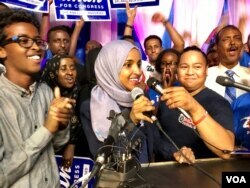 Ilhan Omar addresses supporters after her historic primary election victory to represent Minnesota's 5th District in the U.S. Congress in Minneapolis, Aug. 14, 2018. Minnesota State Representative Ilhan Omar became a major party’s candidate for the state’s 5th District in the United States Congress. Omar won the Democratic Party’s primary election for the area on Tuesday. She is seeking to become the first refugee from Africa to gain a seat in the U.S. Congress. The 35-year-old politician spoke at the University of Minnesota’s Hubert Humphrey School of Public Affairs before Tuesday’s vote. “I am a millennial with student debt,” she said. “And a renter,” she added, someone who is not ready, or cannot yet afford, to buy a home. It was a simple but effective message. She was born in Somalia and wears a hijab on her head. However, Omar said that she was still like the many young, progressive and liberal voters whose support she needs to get elected. It was the same message that helped her make history two years ago in her election to the Minnesota state House of Representatives. Her campaign says there was a 37-percent increase in the number of voters in that election. Mohamed is just one of tens of thousands of Somali Americans who voted for Omar in Tuesday’s primary election. Omar hopes to follow Keith Ellison’s path. Ellison is the first Muslim American elected to Congress. He currently represents the same Minneapolis Congressional District that Omar is competing in. But, Ellison is leaving Congress to run for the Minnesota Attorney General’s office. Minnesota is home to the largest number of Somali refugees in the United States. Jacobs said their votes are only part of Ilhan’s success. He said the Somalia community is not a large voting group. It even split its votes between Omar and another Somali candidate. What Omar has been able to do, Jacob’s said, has been to build a coalition that includes politically liberal voters and people who believe the Democratic Party needs to become more diverse. 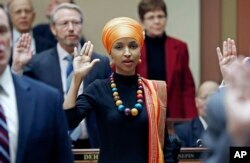 FILE - In this Jan. 3, 2017, file photo, State Rep. Ilhan Omar takes the oath of office as the 2017 Legislature convened in St. Paul, Minn. Omar is the nation's first Somali-American to be elected to a state legislature. Omar is the Democrat’s Assistant Minority leader in the Minnesota House of Representatives. She has opposed the separation of families by officials at the U.S. border. She also has criticized the so-called “Muslim Ban” of the administration of President Donald Trump. Like Omar, many people in Minnesota’s Somali Muslim American community are refugees. They hope Omar’s election represents a chance to change public opinion about their religion and situation. Mohamed believes that Omar’s election sends a message of hope to not just to a religious community, but to all of Africa. "It sends a message to everyone from Africa… that you might be a refugee…but you have rights, and you can be whoever you want as long as you put the work in,” he said. Observers say Omar has a good chance of winning in the general election in November. This story was originally reported by Kane Farabaugh for VOANews.com Phil Dierking adapted this story for VOA Learning English. Mario Ritter was the editor. Are there members of any minority community that you would like to see elected to office? Write to us in the Comments Section or on our Facebook page.